There are several active pest control techniques available for individuals that find themselves disturbed by moles. The mole is a relatively small mammal that consumes insects. Many believe that these creatures are part of the rodent family; however, this is a common misconception. These creatures live most of their lives underground, among a large network of tunnels that interconnect. The tunnels are typically created just below the surface so that the moles may capture insects, worms, and other types of insects for feeding purposes. 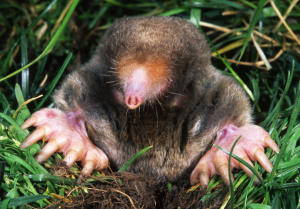 In rare instances, a mole may consume plant materials; however, the greatest damage that these creatures cause is a direct result of the burrowing activity. This often dislodges plant materials and results in drying of the roots. Furthermore, many find the mounds that are caused by burrowing activities to be unsightly on their lawns. Trapping – This is the most common active pest control method for moles. There are several different types of mole traps that may be purchased at hardware stores, nurseries, and similar locations. In order to use these effectively, you should study mole behavior for the proper placement of such devices. Repellents – There are several types of repellents that have been used throughout history to deter moles. Examples include bushes with thorns, mothballs, and whistling bottles. These items may prove effective for a short time, but, most of the time, the mole will return. Toxic Baits – The mole mostly consumes insects and worms. As a result of this, traditional baits are usually not effective. That is unless you purchase toxic baits that are designed to resemble the natural food sources of a mole. If you elect to use these products, follow the instructions on the label closely for your safety.